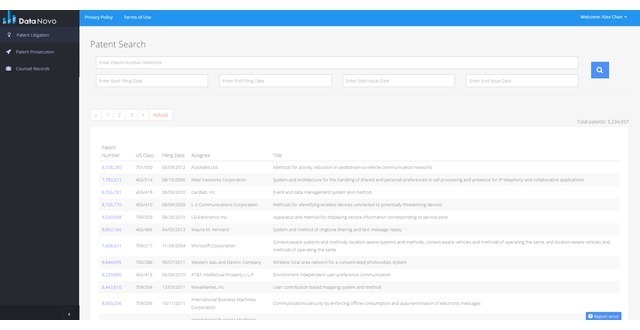 - Date: 03/2016, Seed: $50 k (post valuation: undisclosed amount). DataNovo was selected as one of the top 3 finalists in 2016 SXSW's Interactive Accelerator Award. 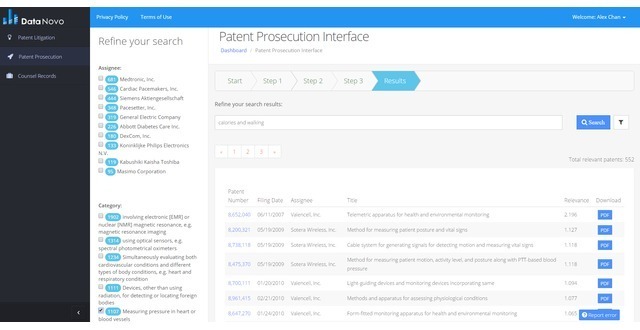 Find prior arts to fight patent lawsuits or validate new products to avoid patent infringement instantly. DataNovo finds prior arts to every patent instantly. Prior art is anything that shows an invention is old or obvious. Companies use prior arts to invalidate frivolous patents and show that those innovations already exist long before. Companies also use prior arts (or a lack thereof) to show why their products are not obvious variations but truly cutting-edge technologies. Prior art is what stands between just an idea and true invention. It’s the holy grail in intellectual property. But finding prior art is a monumental task. It’s hard because you think it’s there but you don’t know where, if it exists at all. It’s expensive because it’s time- and labor-intensive to look through decades of products and literature to find them. It’s slow because prior art searches today are still done manually, by hands and by human, which take weeks, if not months, to complete. Manual searches often lead to poor quality of prior arts. This lack of quality has led to a historical number of trivial patents issued and litigated. Fundamentally, DataNovo aims to solve: 1) how to find the best and most relevant prior arts; and 2) how to find them quickly. DataNovo solves these two industry-wide problems by cutting search time down to milliseconds (from weeks/months) and at a fraction of the cost (e.g., at one tenth of the traditional cost). Enter just the patent number. Using machine learning and pattern recognition, DataNovo is able to identify the key invention in each patent. 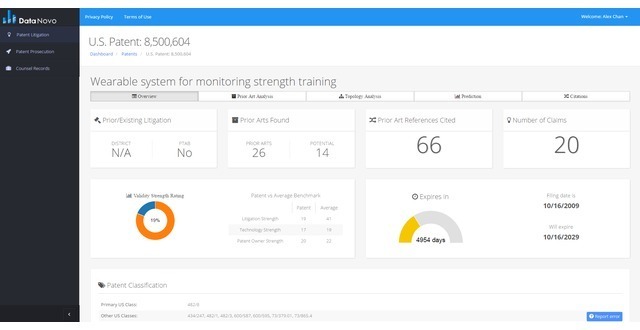 Leveraging on big data and artificial intelligence, DataNovo is able to use the key invention as part of its comprehensive prior art discovery process to identify the best, most relevant prior arts available against that key invention. With these prior arts, companies are able to challenge frivolous patents, make informed choices on potential settlement terms, or design products around those patents to avoid willful infringement. Another feature we offer is the innovation checker. You can check if your new product is truly cutting edge. Describe your product in as few as 6 words. That is all it takes for our machine learning system to understand the product that you have. We will then show you patents that might cover that product. With these results, you can then take steps to avoid patent infringement by designing around them. Never before do companies have this information without being sued or spending millions in patent litigation. The best part is that you don’t need to hire a patent lawyer or a professional prior art search firm to find these patents for you. The results are now available at your fingertips instantly, which saves time and cuts cost in ways never seen or done before. I'm a patent attorney with 12+ years of experience in patent prosecution and litigation. I've drafted 300+ patent applications and litigated 15+ patent lawsuits. I am also a former patent examiner at the United States Patent and Trademark Office. I have a PHD in Statistics & MBA. I have 27 years of industry experience & have worked in the FMCG,Pharmaceutical,Clinical Trials,Education & Telecommunication industries. I always strive to use my analytical skills in the best way possible. Member of DATANOVO Founder and CEO Whisteo, video compositing app. Author of TAKEDOWN (Tor/Forge). Our current subscribers include startups (e.g., Jammit and RocketClub), companies (e.g., Lenovo, HTC), consulting firms (e.g., PWC), IP insurance companies, individual inventors, and patent examiners at the U.S. Patent and Trademark Office. DataNovo operates under a subscription-based model. 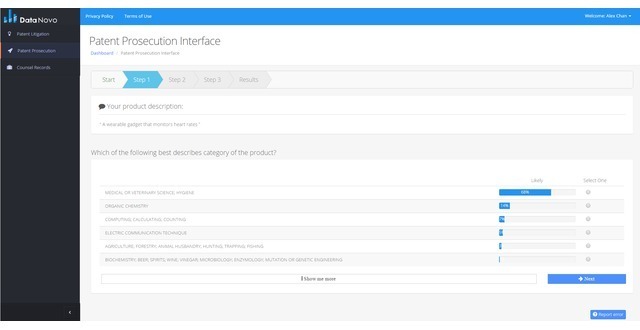 The automated prior art search feature and the product checker each have its own subscription-based pricing model. The subscription-based pricing model is also segmented into a per-use/per-patent plan, monthly plan, and annual plan. The monthly plan and the annual plan also have separate pricing models for limited and unlimited users and licenses. This pricing structure allows DataNovo to target different types of companies based on needs and demands (e.g., startups with lesser usage, standard companies with regular usage, and insurance companies with large usage). DataNovo does not have any competitors who offer automated prior art searches or product checker. Competitors, if any, are manual search firms that hire human bodies to conduct manual searches, the same approach that the U.S. Patent and Trademark Office adopts (via patent examiners), which explains why many issued patents are frivolous because of a lack of best, relevant prior art available to the public. Finding best prior art is akin to finding a needle in a haystack, except the haystack is the size of the whole world. DataNovo is able to cut prior art search time from months down to milliseconds, at a fraction of the traditional cost ($6-10K/patent), and with highly matching results using a combination of machine learning, pattern recognition, and natural language processing. 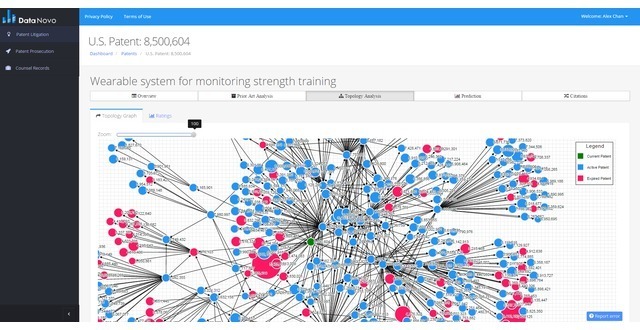 DataNovo uses machine learning to learn everything about each patent. We do the same with the prior art, and play matchmaker based on 180 analytical models. We take the work of countless men over countless hours and collapse that to pressing a single button. Because of machine learning, the results are not constrained by conventional keyword or linguistic-based searches. With big data technologies, DataNovo is able to pinpoint the real invention in the patent, and uses that for the search from the start. This way, you find prior art that are often missed in searches performed by human. These prior arts help companies take meaningful steps to avoid infringement. Never before do companies have this information this early in the game without spending millions in patent litigation (and without spending any resources in patent prosecution). DataNovo currently has two provisional applications and two utility patent applications pending before the U.S. Patent and Trademark Office covering models and algorithms behind patent analytics, product checker, and automated prior art searches. DataNovo Inc. was featured in a VatorNews article: "Datanovo - Vator Splash Spring Class of 2016"
DataNovo Inc. was featured in a VatorNews article: "Vote for your favorite Splash Spring 2016 Startup!" DataNovo Inc. was featured in a VatorNews article: "Today's Entrepreneur: Alex Chan"
DataNovo Inc. added a press mention. DataNovo Inc. added an award.